Going public with her choice for U.S. Senate from Texas, the ‘Freedom’ singer reminds Americans to exercise their rights to vote in the crucial midterm election. Beyonce Knowles has given Texas Congressman Beto O’Rourke a last-minute boost in his run for U.S. Senate by rocking the Democrat’s campaign merchandise online. 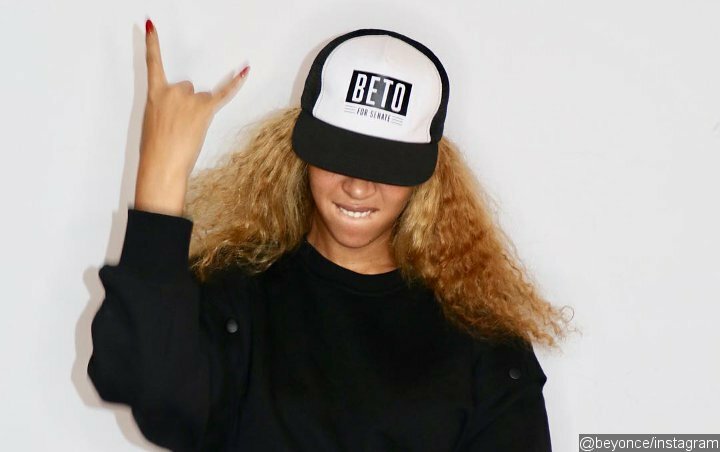 As millions of Americans headed to the polls on Tuesday, November 06 to vote in the crucial midterm elections, the “Formation” hitmaker took to Instagram to share two photos and a video of herself striking a series of poses in a black and white ‘Beto for Senate’ cap. “I’m feeling grateful for everyone before me who fought so hard to give us all the right to have a voice,” she wrote in the video caption, as she rallied fans to get to the polls before closing time. “We can’t voice our frustrations and complain about what’s wrong without voting and exercising our power to make it right,” Beyonce continued. “We need you. We all need each other, because when we are truly united we are unstoppable. Sending you all love and positivity on this happy voting day!”. Beyonce follows in the footsteps of her Destiny’s Child bandmate Kelly Rowland, who headed back to the ladies’ native Texas to join O’Rourke on the campaign trail in the run up to Tuesday’s big voting day. Rapper Travis Scott (II), actress Eva Longoria, country legend Willie Nelson, rockers Spoon, and basketball icon LeBron James have also been backing O’Rourke in recent weeks, insisting he’s the right man to win over voters in the conservative state and oust incumbent Republican senator and former presidential hopeful Ted Cruz. ← Previous Story Caught Making Out in Los Angeles, Is Kate Beckinsale Dating Jack Whitehall?